Dan Burrus is one of the world’s leading technology forecasters and innovation experts. He has been helping stakeholders to see and shape the future for more than 30 years. 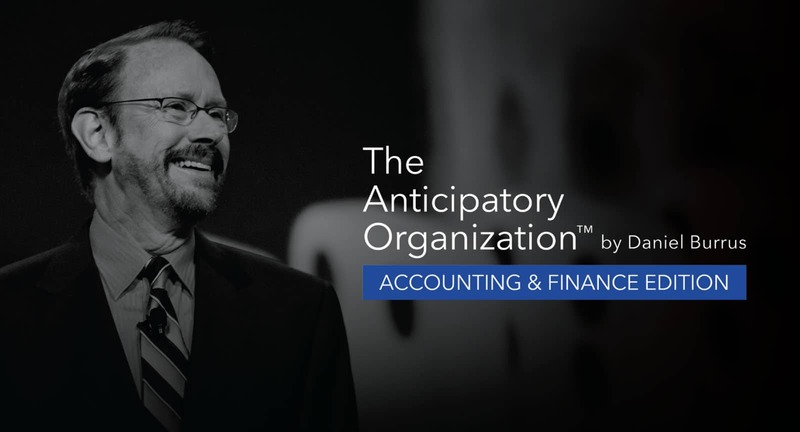 The Anticipatory Organization – Accounting and Finance Edition synthesizes his approach into an “accelerated learning system” that includes a series of short, single-concept videos featuring Burrus that presents the model’s core principles. Each video is followed by a job aid and rapid-application activity that teach you how to apply the concept to everyday activities. The result is a powerful tool that will help you know what’s next, develop opportunities, shape the future and accelerate success. Change is coming, fast. The winners will be those who can anticipate those changes to leverage new opportunities. Reorient your thinking about the future…your future.